The market as a whole rebounded a bit on Monday. The names I picked still have not rebounded significantly from their drops so I decided to drip into these names. I would of liked Colgate but it's still expensive and rebounded a lot so I dropped it off the list. ABT, GIS, and KMB are my super core positions. CLX and SJM I consider not a mandatory core holding but I still think they are high quality dividend growth companies so I added to them since I don't have much in them. So this week I plopped down $3003 and the average yield is 2.71% so this will add around $81 more to my annual dividends. It may not seem like a lot but bit by bit the amount of money I can get per year from dividends is growing. Since I started my investments, I have grown from a few $100 per year to now a bit over $6400. Eventually this income will be able to cover all my living expenses and everything I earn from my main job will just be icing on the cake. Some great companies. ABT is on my current US watch list! Good job taking advantage of the dip in the markets. Who is your broker btw ? I use Capital One and I've been a long subscriber of their weekly Sharebuilder plan. Very nice progress! I like your picks as they are solid dividend payers -- keep up the good work! Some great companies mentioned. We have our eye on ABT, CLX, and GIS. 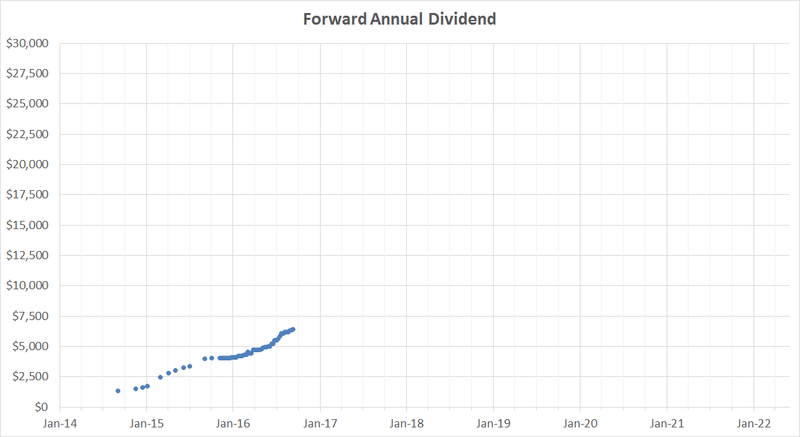 Also, nice progress on that dividend income stream. Keep that foot on the pedal! That's a lot of buys in very safe dividend plays. That will definitely move the passive income pile forward. Thanks for sharing.